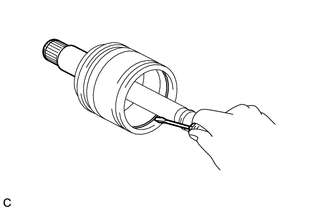 (a) Using a screwdriver, remove the rear drive shaft snap ring. 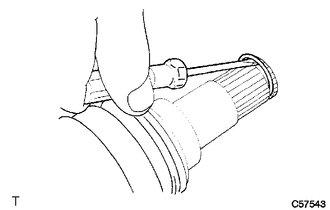 (a) Using needle-nose pliers, disengage the 2 claws and remove the No. 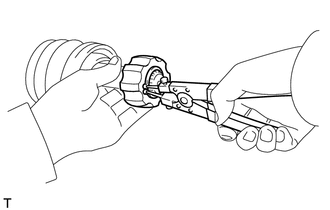 2 rear drive shaft inboard joint boot clamp as shown in the illustration. (a) Separate the rear drive shaft inboard joint boot from the rear drive shaft inboard joint assembly. (a) Remove the grease from the rear drive shaft inboard joint assembly. (b) Put matchmarks on the rear drive shaft inboard joint assembly and rear drive shaft outboard joint shaft assembly. 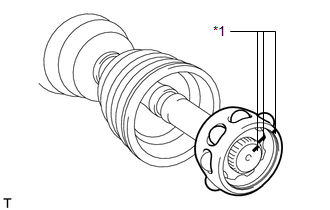 (c) Using a screwdriver, remove the drive shaft snap ring from the rear drive shaft inboard joint assembly. (d) Remove the rear drive shaft inboard joint assembly from the rear drive shaft outboard joint shaft assembly. (e) Put matchmarks on the rear drive shaft outboard joint shaft assembly, inner race and ball cage. (f) Remove the 8 balls and slide the ball cage toward the outboard joint. 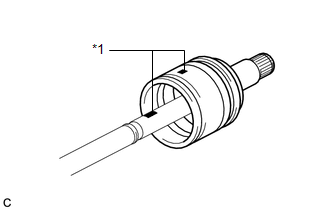 (g) Using a snap ring expander, remove the shaft snap ring. (h) Using a brass bar and a hammer, remove the inner race from the rear drive shaft outboard joint shaft assembly. (i) Remove the ball cage. 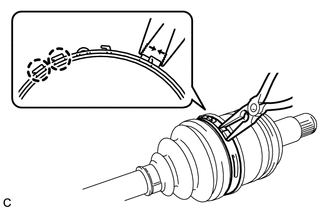 (a) Remove the rear drive shaft inboard joint boot from the rear drive shaft outboard joint assembly. 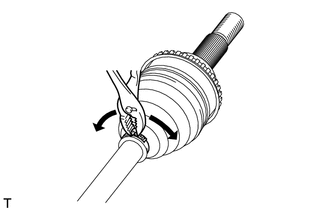 (a) Using pliers, remove the rear drive shaft outboard joint boot clamp as shown in the illustration. 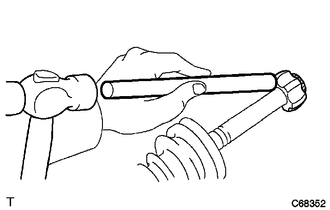 (a) Using a screwdriver, release the staked part of the No. 2 rear drive shaft outboard joint boot clamp and separate the No. 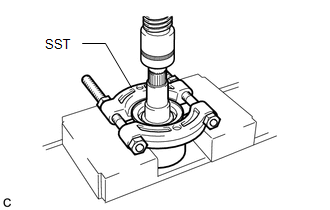 2 rear drive shaft outboard joint boot clamp as shown in the illustration. 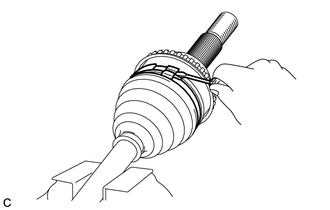 (a) Remove the rear drive shaft outboard joint boot from the rear drive shaft outboard joint shaft assembly. (b) Remove the old grease from the rear drive shaft outboard joint assembly. Do not disassemble the outboard joint. (a) Using SST and a press, remove the rear drive shaft dust cover from the rear drive shaft inboard joint assembly. Be careful not to drop the rear drive shaft inboard joint assembly. Do not overtighten SST.